If you're on the road and see a blue sign with percentages at an intersection in St. Paul, you may want to tap the brakes and watch for pedestrians. Odds are there's someone crossing the street nearby. St. Paul has posted new signs at busy intersections without stoplights to remind drivers to stop for pedestrians. According to Minnesota law, cars are required to stop at marked and unmarked crossings when pedestrians are trying to cross. The signs, developed by the HumanFIRST lab at the University of Minnesota, are a reminder of that. They show compliance rates for drivers yielding to pedestrians, comparing last week's record to that of the current week. The St. Paul Police Department has been collaborating with the lab over the past few months, developing a program to increase pedestrian and driver safety. The program takes a two-pronged approach to safety: education and enforcement. Nichole Morris, a director at HumanFIRST lab, said that the signs were designed to draw drivers' attention, then inspire them to give pedestrians their right of way. "The idea behind them is a principle called 'social norming', where you can provide information to people about how most people behave," she said, "If I can show people, 'hey, most drivers in St. Paul stop for pedestrians, and you should be one of those most!' I like to be a part of the good group, and I think most people are the same." And the psychological influence appears to be working. Last fall, U of M researchers recorded the average percentage of drivers who stop for crossing pedestrians to be around 30 percent. That number has since been climbing steadily, with the current record standing at 52 percent. Some areas, such as Snelling and Blair avenues, are doing better than others at 62 percent. Others, like White Bear and Nebraska avenues, are hovering at 24 percent. Despite this disparity, police officials said that they are already seeing results. Cmdr. Jeremy Ellison, the Police Department's coordinator for its Towards Zero Deaths campaign, said that the number of violators has dropped since the signs were put up. "I was out this morning with the officers. Our first street that we worked, I think we only wrote three or four citations at that intersection, so I can tell you that it is having an effect," he said. "I can tell you that the number of tickets most likely will be lower this wave than they were the last wave. And that's a good thing because this means that people are being compliant with the crosswalk law." 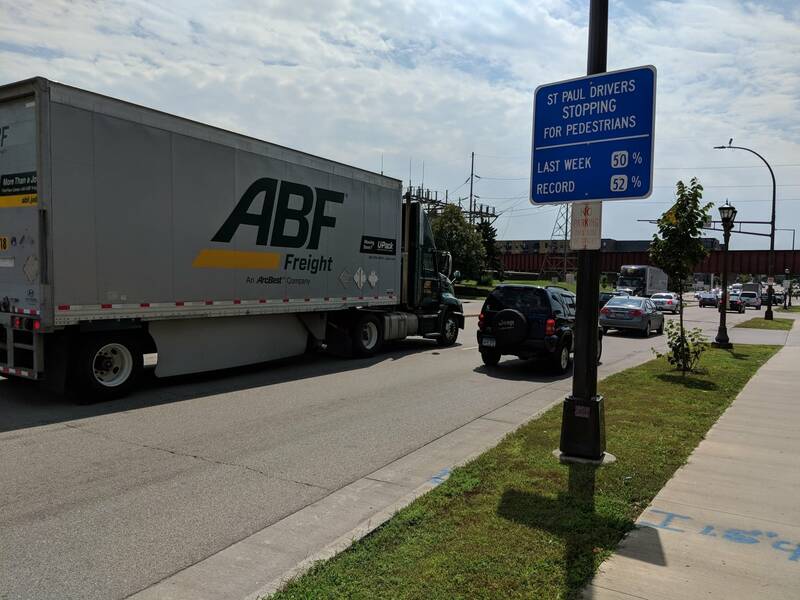 To accompany the gentle reminders the signs provide, the Police Department is rolling out an enforcement wave on Monday, watching for drivers violating pedestrians' right of way and issuing tickets. Ellison said that the police are watching for a few behaviors in particular. He remarked that drivers in St. Paul often try to pass vehicles stopping for pedestrians at intersections, a violation that is even more dangerous than not stopping for pedestrians. He said that enforcement has been effective in curbing this behavior, by ticking the "endangerment" box on the citation given to the offending driver. "One of the things that we've been doing is when we issue citations to vehicles that pass another vehicle is we've been checking the endangerment box," he said. "What that does is it forces the driver who receives the citation to go into court and have a little bit more consequence for those actions." Looking ahead, Ellison sets an ambitious goal for pedestrian safety: 100 percent compliance with the crosswalk law. "It would be ideal if we can go out and work a pedestrian safety event and not have to write any tickets," he said. Correction (Aug. 8, 2018): An earlier article misidentified the timeframe of compliance rates. It has been corrected to comparing to each week.